Grace Delmolino received her PhD in May 2018 from the Department of Italian and the Institute for Comparative Literature and Society at Columbia University. She is Senior Assistant Editor of Digital Dante. Her principal areas of research are Dante, Boccaccio, medieval law, and gender studies. These research interests coalesce in her dissertation, now being developed into a book, which explores how Boccaccio’s study of canon law informed his treatment of socio-legal issues involving women, gender, marriage and sexuality. 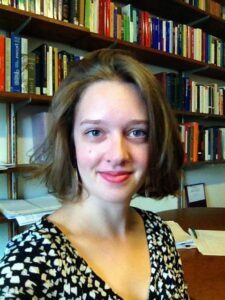 She has published several essays on Boccaccio and the law, and is currently also working on a project that examines the role of lawyers and legal culture in the Divine Comedy.